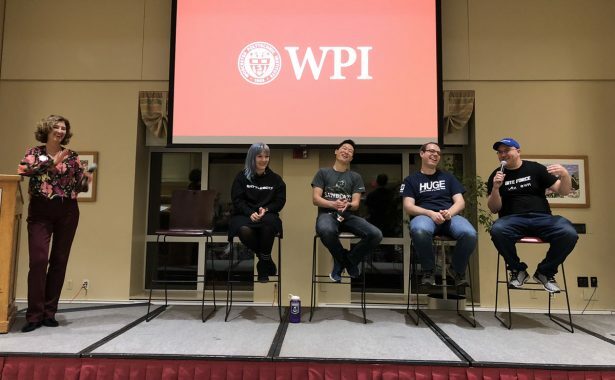 This past Friday night, I watched the BattleBots final four battle it out for the 2018 BattleBots Championship at the WPI University Watch Party supporting Team Bite Force. 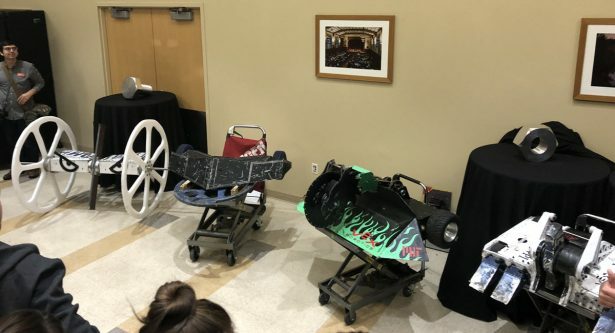 There were four local Teams with their robots present for the night: HUGE, Valkyrie, Saw Blaze, and Bite Force. And, by the way, HUGE, was a really HUGE robot! Q&A with BattleBots team leaders. Left to Right: WPI President (and Host) Laurie Leshin, Leanne Cushing (Valkyrie), Jamison Go (Saw Blaze), Jonathan Schultz (HUGE), and Paul Ventimiglia (Bite Force). Robots left to Right: HUGE, Valkyrie, Saw Blaze, and Bite Force. We watched the final four Bots fight it out, and while it was hard to root for a favorite—as all final four bots were designed in SOLIDWORKS—we were all there supporting team Team Bite Force. The Q&A was great, as there was a lot of great insights into why robot designs were chosen and what happens behind the scenes. My favorite question came from one young fan who asked which robot they all liked best (besides their own). Big cheers came from the crowd as Bite Force took apart Whiplash in the semi-finals, then again against Minotaur in the finals. In the end, Team Bite Force won their second Giant Nut and became the 2018 Champion. I don’t want to share too much detail about me interview now, but it’s all in the podcast. If you’re a BattleBots fan like me, or interested in how they design fighting robots, I think you will want to hear more about all of the excitement from outside and inside the arena. Paul also talks about how he designs robots for his job, and how he mentors other robotics teams. Be sure to subscribe and don’t miss any inspiring stories from the Born to Design Podcast. Hi there this is the SOLIDWORKS Born to Design podcast a podcast of inspiring stories about those who create build event and transform new ideas into actual new products and by the way they all use SOLIDWORKS. I’m your host Cliff Medling in this episode is titled, kicking bot and taking names. And Today I’ll be speaking with Paul Ventimiglia, who is the battlebots team leader for team fight force. Paul has been building robots since he was 14, and is now a three time battlebots champion. He also works building robots in the high tech industry. Let’s jump right into my interview with Paul. I’m really excited today about this interview with Paul bit Amelia. He’s the battlebots team leader for Team bite force. And I really want to talk about how you got into robotics and how you first started hearing about battlebots. But I I felt like it had to first start off by congratulating you, your second giant not that’s got to be pretty exciting. So congratulations. How’s that feel? Thank you. It feels amazing. It’s it’s really unbelievable. In the sense that it’s been about 18 years since I’ve started working on combat robots in general. And back then the idea of winning was so far away. I know, I can’t even believe 18 years. You’re not even that old. So it’s, it’s amazing that you’ve been doing this long. Yeah, I was 14 at my first robotics competition and built the robot when I was 13. And it’s been a long, long journey to get to where I am now. We’re very comfortable building robots in very short time. That’s great. And I mean, what, what got you started 13 building your own robot? So it’s a common question. And I think the answer I always give it it’s true is I was really interested wanting to build animatronics for movies and TV shows. So sort of the things that were most exciting to me. We had watched some movie like Jurassic Park, or Star Wars, or Terminator. And I wanted to build the actual puppets, the robots and the animatronics that were in the movies. So when I would see like a behind the scenes special or something on TV, that was the coolest thing ever to me, and to see how they’re real machines that were looking interesting and being cool. I don’t know why that was just very interesting to me. And I was always interested also in RC cars and toys. And one of my cousins started working at an RC car shop that was a little bit more professional, and better. And so as opposed to the RC cars, you can get at Toys R Us or Walmart, this was going to the real RC cars were much more impressive, and engineering in their power. And that was the real starting point for robotics is a lot of the same parts of us in small robots are the same thing as the high quality parts from the RC car industry. You can see a lot of the battlebots are you know, they’re good drivers always talk about being you had to be a good driver as well. Not just a good designer of a attack robot, right? Yeah, that’s driving comes up a lot. And my answer to that usually is that I think, uh, well driven robot, like a good looking driver is largely due to the robot design. So. And when I see what appears to be a good driver, I think it’s largely attributed to the robot by that is, if you have, let’s say, a long robot with four, six wheels and you tell to go straight, it’s probably going to go straight pretty well. If you have, for example, a two wheel drive robot, though it’s a lot harder to control, even just going in a straight line. So a lot less traction, and there may be dragging some part of the robot. And so when I see a robot that, you know, looks awfully driven, it’s often just because it’s two wheel drive. And that’s a squirrelly type of robots to drive around. And so there are certainly good drivers and bad drivers in the sport. But I think the engineering of the robot has a lot more to do with it. That’s interesting. So I have to ask, you know, with this year’s competition, you know, to stone one last year, but what are the biggest feared battlebots for you, which ones are the ones you a little bit more nervous about competition? Well, there’s, there’s a lot actually, and tombstone is one of them. But Tim stone is easy to prepare for. It’s not fun to fight. But my method of operation for our team is just slap on all the armor we have for our sort of low wedge mode. And one of the primary things we designed for is finding a robot like tombstone. So we have a pretty easy armor configuration for that it’s sometimes a lot harder to prepare for, for example, the our first opponent in the tournament was huge, which has been making a lot of headlines this year, and a lot of excitement because their design is so unique and different. And it looks like they’re sort of a really fun team and robot. And they are and so they’re out there to have a good time. But their robot has really hard to actually face from a strategy because they have giant in a 40 inch diameter wheels. Whereas our wheels are five inches, for example, they’re spending weapon is 20 inches in the air. And it tells part of our robot is even only 16 or 17 inches off the ground. And so they’re spending weapon is so high up, it’s in their body is so high up, it’s hard to actually hit them besides these flexible plastic wheels, right. And that was huge, right was it? Yes. So against huge, we actually had also the least amount of time repair. So what happens is they try to give you you know, as TV show, they want to give you preparation time. So if they can tell you the night before how you’re going to face this robot in the morning. That’s great for everyone. Everyone has a little bit more time a few extra hours to get your parts together to prepare for the start of the tournament. We were one of the first matches from the time they announced it till time we thought was only a few hours. And most of that time they want you sort of lined up and ready to go. So you really only have a couple hours to do any changes to the robot. So certainly not enough time to go out to a store and buy some material and bolted on. So at that point, it’s seeing what or if we can do it the pit for this unique opponent. And my teammate JJ I remember what started the event before we knew about the bracket who are facing he like how could you possibly fight you know, robot like that? I didn’t have a good answer. No, none of us really had a good answer. And they certainly almost beat us to and that was that was a really surprising match. And we’re lucky we sort of outlasted them. But otherwise their their weapon really took ours out and causes some big problems. Yeah, that did well this year. That was definitely a unique design. So yeah, that that’s fun. So he just one of the hardest ones. Otherwise, in general Bronco is sort of hard to face because any one good flip they get can be the end of the match for you. that’s fine. Yeah. So so many good raw lights in the in this competition this year on Discovery Channel. That was great. You know, I’m a big fan of battlebots before I even met you. And I watched the show with with my sons. And I actually told my son, I said, Hey, I’m talking to Paul from Bite Force today. I said, What? What would you like to know? And he had a great question. He said, What advice would you give for somebody getting started? Like, what’s the first step? How do you even come up with your original design? He just gets out somebody. So what’s that? How do you jump in and get started? That’s a good question as two different ways of answering one that people ask is, how do you build a Balibar for the show I’m answer for that is very simple. It’s focused on sort of your whole team package, and the robot matters less. But then in terms of how to build a fighting robot, or combat robot in general, it’s, it’s go out there and go on the internet and start searching for what you can find, and watch a lot of YouTube videos, buildit websites. So when I, when I started, when I was a kid, it was dial up modem. And people had these sort of handcrafted websites where somewhere sites are pretty good, some are pretty bad. But the few good ones were filled with so much information and writing and pictures and sort of build diaries that it was a great resource for learning how to build something that I’d never done before. And the reason was, a lot of those people had also never built a robot before. So they were documenting it from a sort of new person perspective, where they’re like, learning about what kind of motors to use. And they post pictures saying, This motor works really well, here’s why this motor burnt out in two seconds, I would never buy it. So they sort of would do this testing for you. And now there’s so much information on people’s websites and on Facebook pages, and on YouTube videos of people showing how to wire up certain speed controllers, and what kind of batteries to use. So there’s tons of information out there. And there’s a few companies that build little kits actually made by sort of robot competitors, for robot competitors. And for beginners, that are pretty useful to us. Like one of them. For example, finger tech robotics, it’s sort of the driver of lucky as you see this season curtain, here’s a kit that’s a couple hundred dollars gets you an entire one pound fighting robot ready to go with everything you need. And that’s a great method for, for starting out. And you could enter that in a competition that you find nearby. Or you could modify it and make it better. Or you could just learn to use it as a tool to practice driving, or learn about some different components. You mentioned so often how much this is a community, like when you’re fighting other robots, it’s your robots are fighting that you guys don’t have a grudge against each other, well, maybe there’s some grudges out there. But But you said it’s such a community, everybody helps each other out. It’s it’s a great community in battlebots, and fighting and robotics in general also mentioned the high school kids and FIRST Robotics and it’s the same kind of feelings in the pits. And so at battlebots, for example, you have all these different teams that have worked so hard to their machines, and they all get to the event. And pretty much everyone is not ready by meaning they’re not sitting back comfortably waiting for a match to be start now, everyone either really not ready like the hair still both in the robot together for the first time and song and drilling parts, or they, you know, they feel pretty good, but they don’t have a lot of practice time. And so because of that tons of things break or don’t work. And we’re constantly scrambling quickly to find a solution. And your best resource is just asking another team who’s right next to you, who is probably an expert in the sense that they just solve that same problem, you know, hours ago, or days ago, or they’re using the exact same component as you. So it’s pretty cool at the event to be able to just walk 20 feet away and find someone who says, Oh, yeah, no problem. I’ve done that before. Or here’s the part that you just broke, I’ve got a spare one right here. engineers. In general, I hope I hope it’s, I’ve been a mentor OF THE FIRST Robotics first is an acronym or for Inspiration and Recognition of science and technology. And that was created by Dean Kaman in the early 90s, but I learned about it when I was a mentor of the program at WPI. Because a lot of the people in the same lab I was building robots in are saying, Hey, we have this team, we work with these high school students, you should, you know, help out join our team as a mentor. And I got sort of hooked in that, because it’s a great program in terms of competition, robotics, and using engineering in a competitive way, I think is a great way to learn a lot really quickly, and teach a really broad spectrum of skills in terms of design and brainstorming, initially doing detailed work, in SOLIDWORKS, for example, detailed designs, and then actually getting those parts made by yourself, and by external shops all within days, and not months, and then testing out your ideas. And then at the event, you’re learning about how to work with other teams, and people how to fix things quickly, under sort of stressful situations. And if you’re like myself, and you weren’t really into a lot of other sports, then it’s a great outlet to have all the sport benefits. Also just rooting for a team working together, trusting your teammates. So that’s all really big. That’s great. And, you know, we talked a lot about STEM, I just think, especially with the drones these days, and the robots in the battlebots, it’s a great way to introduce, um, you know, younger people to engineering because we still need a lot of engineers. So with that, you know, what, what, what, what’s the future, in your opinion, for robotics? What’s your vision for the future of robotics? Yes, it’s really exciting stuff. I mean, so I’m thinking back to when I was a kid. And sort of the only throw bot kit and parts I could have were the original Lego Mindstorms kit, which, which was great, but we didn’t even have a computer that could program it, and all sorts of limitations and problems. And now those kids that are 11, 12, 13 have things like the Vex robotics kit, which is like real metal parts, real motors, and gears and real programming, you know, they buy those kits at home, or having the classroom and there between the ages of 8 to 15, they’re becoming sort of robotics, programming experts, and learning about torque, and motors. And so for the future, I have some pretty high hopes. I think a lot of young engineers, when they’re, you know, age 20 to 25 get most of their work done in sort of all history, going back into thousands of years, it’s been a lot of those people do their most impressive work. And so by having more tools in the hands of kids in their younger, I think, is going to start producing even more stuff really soon, because those when those kids are turning 20, and 25, and they’re working really hard. They’re just that much ahead of the curve. And I work as my day job and sort of a robotics um, startup where we’re still Robbie technologies. And we’re delivering packages or groceries with sidewalk delivery robots. And the goal is, you know, full autonomy. And so right now, it’s, it’s sort of this game of finding all of the sensors off the shelf, and then seeing which ones you have to make cut for custom sensors that aren’t available yet. And trying to make all those components work together. And that’s still a big part of robotics today is just making a system of parts work together. And a lot of finding those parts. And so each year, there becomes more companies making more sensors and better computers and parts and more easily available, where you can actually just click it and buy it at a good price. And it arrives soon, and it works out of the box. And we’re still not to that point yet. And we’re getting there soon. But still, it’s a lot of being able to find the right components. And then right when you go to plug it in, and it magically doesn’t work and you’re trying to figure out why. And if you have to write something custom to modify it, or make your own sensor or your own program to talk to that sensor. And so we’re still not there. And I think that means there’s a lot of opportunity for the future or when those things get better. It’s it’s, it’s exciting stuff. I agree. Paul, I have to ask you this one question. Because I think it’s interesting. You won in 2015 won the giant nut and then as soon as you won, you immediately just decided on designing a new design that was that was that just because you just love robots and you love building them, you want to try something new, or uh? I’d never heard that story that’s interesting as I thought bite force was the original design away from there that’s that’s interesting. more insight into the battle behind Yeah, I was just gonna say, you know, there’s definitely a lot of vertical spinners these days. I think they’re doing realizing their do pretty well. Yeah, so now there’s a lot of vertical spinners and there are probably be some pushback, it says, sort of easy to designed to do well, because there’s, you don’t need as much horsepower and stored energy in the weapon to cause a lot of damage, because you’re using the floor to react again. So when you hit, someone pushes yourself into the floor, you’re already on the floor. And it puts all that energy and opponent pretty perfectly, as opposed to, if you’re a horizontal spinning weapon, like a tombstone or a gigabyte, then you’re pushing yourself away equally. So you have to sort of share the energy absorption and vertical spinners are really common in the small weight classes I used to have 15 years ago, at the 12 pound weight class. But we haven’t seen them as much in the big robots for some reason. And now there’s a whole ton. right? Well, they got to be fun, because they flipped things up in the air, right? That the design in which you can get a cross between offensive and defensive. So the front of by force, we have a bunch of different sort of plows and wedges and attachments. And the idea is that if you put a big sort of plow in the back of your robot, and you use the idea of trying to stop them, and then turn around and use your weapon on them, that’s not going to look good. And all the judging rubrics you’ve had recently. So in many cases, that could count against you, because you’re not using your weapon when you’re attacking, or you’re not using your weapon to try to control and so if you can put the wedge and the weapon together, then it’s a lot better if it comes down to the judge’s decision. That’s great, Paul. It’s really all I had. I feel like I could ask a couple more questions. I just wanted to ask about the one match that you had where you lost power for a little bit there. Yeah, that was pretty darn scary. I’ve never had something exactly like that happen. And I really never seen it work to come out of it so well. So what happened was, we know we’re up there as the big hit, I knew immediately the robot was unresponsive. And there’s really only one possible source in that case, there’s one power switch that controls everything. And then there’s one radio receiver, every type of other failure you’d have would be independent. And so for the whole robot to go down, it had to either be that main power switch, or the receiver as much more likely to be the receiver just because of how they’re built and the construction of them. And so one thing I tried was sort of restarting the transmitter. And I never thought to try that again. And what that would do is only would fix like a certain situation, which would be in case the transmitter had been over saturated with too much radio signal from all of the production equipment in that room. There’s lots of 2.4 gigahertz, like Wi Fi, and microphones, and lights, and all sorts of wires, this things in the arena. So if the channel has become saturated, maybe turning it back on, again, it caught a Clear Channel would be the thing to do it. And that appeared to work. The reality is, we’ll never know exactly what it was that made it work. So it’s also vaguely possible that the power switch sort of metal contact, how to do it on it, and the shock it came and resettled on or the receiver, you know, similarly had some of weird boot up, and when I restarted the transmitter, it may be helped connect again, there’s really no way to know. But uh. it takes a little luck sometimes, too win. Yeah so. and they’re all isn’t the same receiver as season one and Season Two so far. And we do shock on everything really well. We have sort of rubber oscillators and additional sort of foam, and all strain relief connections and glue and epoxy reinforced electronics. And we ended up sticking with it. And it turned out to be an okay and right decision because we were worried that we would put a new one in, it looks okay, but there’s no way to really test that in the box. And so if you get like a bad cold solder joint or something, which appears to work fine in the bench, but in the arena, it shows a problem, then there’s no way to have any testing time on that. And so similarly, we made a big change during the event, which happened after the end game match. And before bombshell, sort of our last match of the pre qualifying matches, and we changed the whole weapon motor system to use all four mag motors as opposed to the one big motor we had before. And we wanted to get real box time on testing that new part out. And so that was a big deal to put that in a match before the tournament and use it in a way that we stressed it really hard. So I think we show an extra level of aggression against bombshell because we’re trying to really test out that weapon system and sort of break it and we wanted to break it before the tournament. that’s awesome. I haven’t actually seen that one yet. So look for that, so spoiler alerts if you haven’t watched the whole season I’ve been taping them on Discovery Channel So Paul This is great thanks for your time today I could talk for another hour about battlebots but maybe that’s just me but I think there’s a lot of SOLIDWORKS users who are definitely tied into battle but it’s an interest for them as well so. Yeah thank you because it’s always fun to talk to you about it and I know is knew from the start that how you how into your so it’s is really cool when someone is both into it and a supporter of our team so it’s really thank you Cliff. Thanks for listening today and remember that if you are interested in robotics smart products and mechanics like Paul is learn more about building your electromechanical products at solidworks.com/mechatronics thats solidworks.com/mechatronics. And hey, we’ll be back again soon with more great born to design podcast stories at solidworks.com/podcast or wherever podcasts are readily available. Until then, keep innovating!